When I think of Aeropostale, I mostly think of how in middle school my friend and I got into a major fight by the pretzel kiosk in the mall over how to correctly pronounce the retailer's name (I'm still not completely certain). Now Aeropostale is catching shoppers' attention for a very different reason. The teen outfitter is suing mega chain H&M for its use of a certain trademarked phrase. 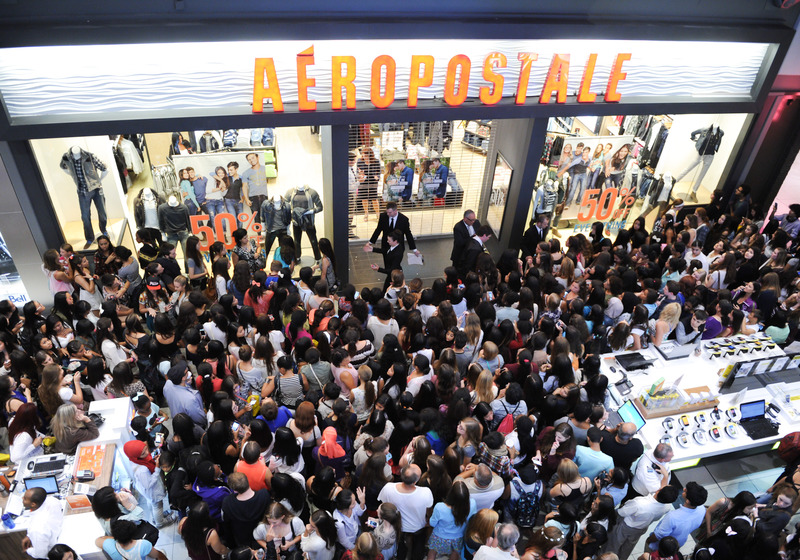 Like many of us, you may be wondering why a brand like Aeropostale would dare to take on a store as massive and powerful as H&M. Apparently, H&M's use of the phrase "Live Love Dream" on certain clothing and accessories didn't sit well with Aeropostale, whose reps claim that they have trademarked the phrase previously. Aeropostale reportedly got in contact with H&M in March to make them aware of the issue, but H&M didn't remove any of the merchandise. And that, kids, is how a lawsuit happens. According to the official complaint, "H&M continues to display and/or sell products bearing numerous trademarks owned and used by Aeropostale." Doesn't sound too good, right? But despite the severity of Aeropostale's claims against the Swedish retailer, such legal action is a common occurrence in the retail world. A brand's name and trademarks are what make it stand out in a market that is highly competitive and pretty merciless in terms of which stores survive and which do not. Aeropostale is among the stores that have taken a hit in the past few years, with the company reporting a 15 percent drop in sales at the end of 2013 during some of the biggest shopping months of the year. Fashionista talked to Stephen Lott, an intellectual property lawyer at Lott & Fischer in Miami, about the lawsuit. He said that the lawsuit is more likely an effort to prevent the Aeropostale brand from becoming diluted than an effort to earn money, as the lawsuit itself is probably going to cost Aeropostale quite a bit. It seems odd that a brand as modern and trend-conscious as H&M would be copying Aeropostale rather than, say, I don't know...almost any other retailer. Aeropostale is aimed at pre-teens, while H&M is focused on the fashion-forward young adult. Strange, but odds are that Aeropostale will still receive a generous settlement out of court, as seems to be the trend with these type of cases.